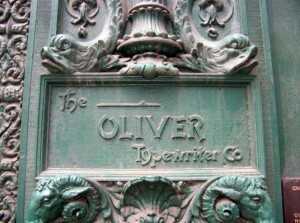 At 159 North Dearborn the facade of the Oliver Typewriter Building sits very quietly. 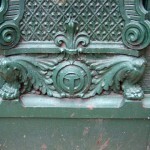 Its dark green cast iron front is covered with the dirt and grime of inattention, but the intricate beaux-artsy detail was obviously very important to someone, once upon a time. 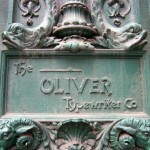 The company was founded in 1894 by Methodist minister Reverend Thomas Oliver. in 1892 he applied for a patent on his unique design for a “down-strike” typewriter. This allowed the typist to see the line he or she was typing, as opposed to the more widely used “front-strike” typewriters at the time. 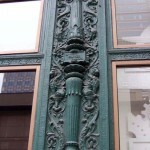 The original corporate office was established at the corner of Clark and Randolph Streets in 1895, but in 1907 moved to 159 North Dearborn, where it remained until 1926. 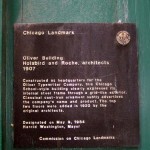 The five-floor building was designed by the legendary Holabird & Roche, and two floors were added to it in 1920. The building was designated a landmark in 1984, but in 1997 the city exercised its right of eminent domain to hand over the building to developers for expansion of the backstage area of the Oriental Theater next door (now called the Ford Center for the Performing Arts). 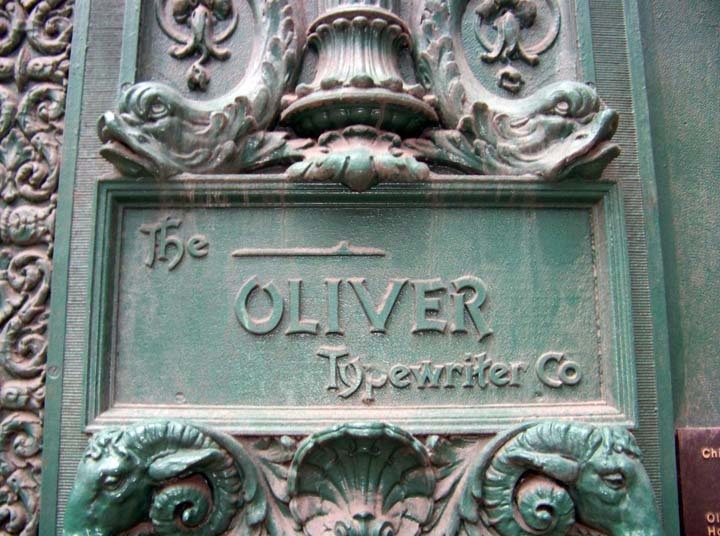 Now all that remains of the Oliver Typewriter Company is the facade. 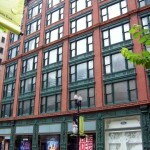 The street level windows serve as advertising space for the theater district, and the upper windows are uniformly blank. I wish someone would give the building a good power-washing and let its beauty shine.